Due to favorable conditions we decided to follow a route along the west side of Corsica which normally is more windy but has the best places to visit and the best protected bays to stop for swimming. Captains Commentary: We arrived in Nice airport but not my bag with all the necessary items to be able to send a day picture of the new boat. With a rented car we arrived in Hyeres. The next day the lost bag was found and delivered to our boat and we are able to send you the first picture of the boat moored in the port of Hyeres.We had a very thorough demonstration of the interior of the boat and we had our first dinner on board focacia , salami with goat cheese (chevre) and our first bottle of the excellent red wine that was onboard courtesy of Mr Lemonier the CEO of Amel. 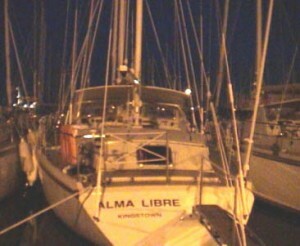 It was a difficult but very pleasant first day on board Alma Libre. Captains Commentary:Today was a hard day. My friend George who is helping me is providing tremendous help. Without him the job would have been much more difficult and for sure less fun. We tried to buy everything necessary for the trip but it seems that there is always something missing. We continued our training on the machine room the watermaker and the generator. The weather was perfect for a wonderful sailing but we had to supply the boat with food, tools, diving equipment, ropes etc. The raymarine instruments are very nice and POCHON has made a very good job for the installation. Now it has to be proven if they are really reliable. It was a difficult day but tomorrow we were promised to do some sailing. I hope is going to more interesting.. In the night we removed the brown Alma Libre letters and placed the logo that I have prepared in Greece which is much happier than the letters provided by Amel. Perhaps they are going to ask us to supply the letters for the boat naming in the future. 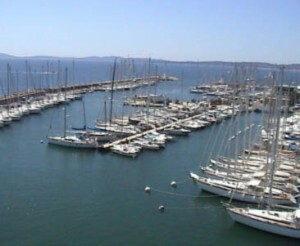 George was 4 times on top of the mast for the calibration and took very nice photos. We reached 8.1 Knots and it was really wonderful sailing without waves, a lot of wind and a wonderful port with a lot of sailing boats and relative full of people for that season. Captains Commentary We left the wonderful Island early in the morning and on the way to Cannes we stopped for swimming at IldOr. It was really nice after so long time to swim in such a nice place. In the afternoon we arrived in Cannes. Gianna and the children will arrive here from the Nice airport. 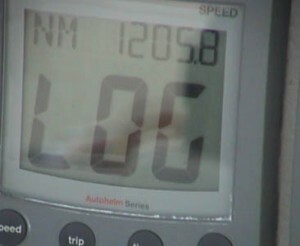 This was the first real sailing 51 nm. In the afternoon Gianna, Elena and Hara arrived in Cannes. The children were very happy to see the new boat and started to look around. In evening we had a nice dinner all together. 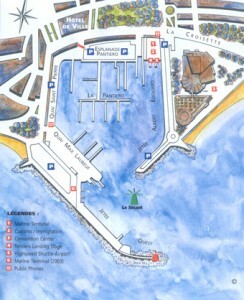 In the morning before leaving Elena started to draw the old town of Cannes from the boat. I felt that she was happy so am I. She really likes the place and I am sure that she is going to enjoy the trip. 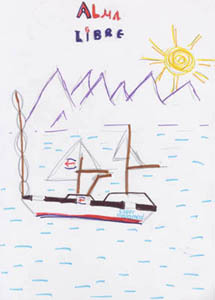 Elena brought to me this nice drawing of the boat as a gift. I think that she also dreaming of the trip. Captains Commentary We left from Cannes for St.Tropez. 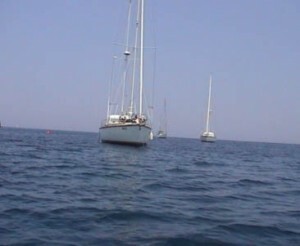 On the way we stopped for swimming again at Ild Or and arrived in St Tropez after nice sailing in the gulf. 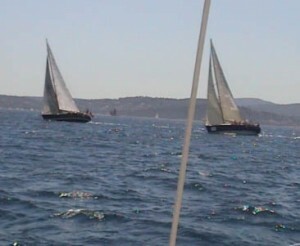 There was no place in the Harbor as the Rolex Cup was starting. So we anchored out side the harbor and had wonderful view of the best sailing yachts and megayachts sailing against each other. It was fantastic.Elena and Gianna enjoyed very much the city and the shops and we had a very nice dinner in St-Tropez. Captains Commentary: We left Calvi 8 o clock in the morning the wind was very low so we had to motorsail along the West Corsican coast. 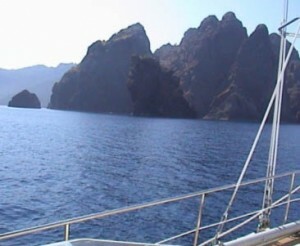 The mountains are very high and the rock formations along the coast very impressive with red colors and high peaks. 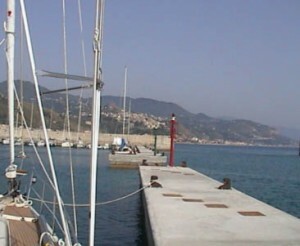 We stopped in Girolata for a refreshing swim and it was really very nice. The sea water temperature was really pleasant but the water is not very clear as it is in Greece. 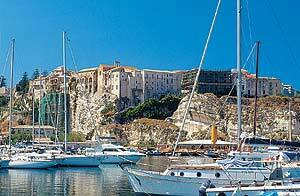 The surroundings are very nice and after a quick lunch we continued motor sailing to Ajacio the capital of Corsica . On the way we passed in front of Cargese which is a small port that was founded in 1663 by Greek people fleeing from Mani. We wanted to stop and visit the Orthodox church but as it was late we decided not . 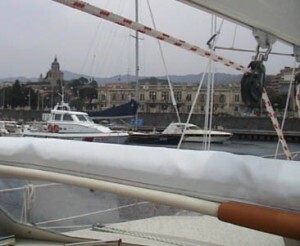 We arrived 6.30 and moored at Vieux Port very close to the house of Napoleon Bonaparte. The arrival was not very easy as we faced problem with the engine (?) 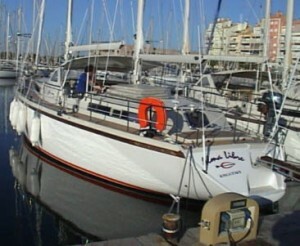 during the manouvers in the Port. Captains Commentary: Due to the problem Amel proposed to stay in the harbor as they think that the problem was due to the hydraulic gearbox and Amel suggested us to wait their technician to arrive tomorrow and to fix the problem. 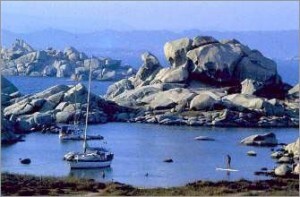 So today was sightseeing in Ajaccio and we hope that we will leave tomorrow for Sardinia through the Bonifacio straits. 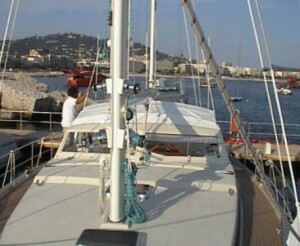 The Amel technicians arrived in Ajaccio at 8 am. They changed the hydraulic gearbox and repaired the dish- washing machine. I believe that they provided excellent after sale service as they came from La Rochelle to Marseille and from Marseille to Ajaccio in Corsica carrying the 40 Kg gearbox 8 Liters of ATF fluid and various other small parts and tools. After the repair we left at 1 pm for Bonifacio with no wind at all. On the way Gianna and the children prepared nikoli a sweet that they like very much. 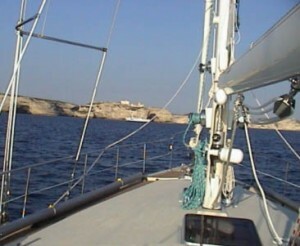 We arrived in Bonifacio at 7.30 pm and we entered in one of the most spectaculars harbors of the west Mediterranean. It was worth a visit. 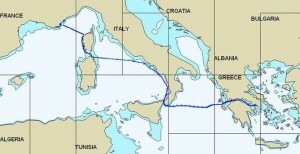 Captains CommentaryWe started in the morning sailing for the notorious Bonifacio straits. The last time in 1996 I was here during the delivery of our previous boat it was really blowing hard but this time it was only 7-10 Knots wind, We stopped in the wonderful Lavezi Islands . It is very rare that the weather was so calm so we took advantage. 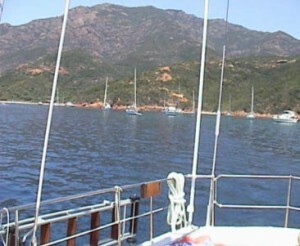 After the swimming we decided to sail to Mandalena for lunch and then to continue for Porto Cervo in Sardinia. Porto Cervo is exceptional development with a very nice marina and a shopping center like in NY but in the middle of nowhere. Even Bill Gates has a house here. 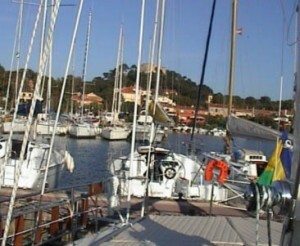 Captains Commentary: We left Porto Cervo 3.30 pm and started our overnight sail to the Italian mainland. We arrived in the small island of Parmarola around 11 am next day but it was full of boats so we left for Ponza.In Palmarola we found out that the problem with the engine has not been resolved as during the anchoring in a crowded place I found out that the engine was not providing power so we decided to sail for Ponza which is a very nice spot in the Mediterranean sea. In Ponza we had a very nice time. We prepared the dinghy and went for swimming in a wonderful beach and we had a very nice lunch with typical Italian spaghetti. Xara was very happy because this is her favorite food. The people were very friendly especially when they found out that we are Greeks. We hope that Amel will find the problem as I start to loose my trust. Captains Commentary We started our trip early in the morning and we stopped for lunch at the Island of Ventotene which was used at the roman times as an exile. What a coincidence, we met an other Amel boat which belong to an Italian and he is making the same trip from Hyeres to Napoli and we met them in Ventotene. So this is perhaps the only pictures of two Amels with hull number 370( mine) and hull number 371 in a very nice place like Ventotene. 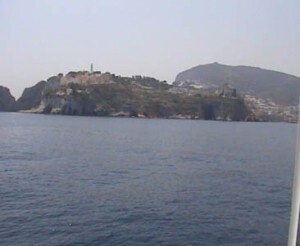 After lunch and a very nice dinghy ride to the old roman harbor we left for the island of Ischia. On the way we stopped the boat and we were swimming from the boat in a very deep sea. The children enjoyed it very much. But what a surprise we entered the harbor with a lot of wind and the motor was not functioning so after a terrible ride in the harbor avoiding the incoming and outgoing boats with the help of the marina personnel we moored the boat . It was really difficult the bowthruster helped a lot but we have to find the cause of the problem. We cannot continue like that. Captains Commentary Mr. Bredisini came around 9 am to our boat to bring out the air from the fuel system. 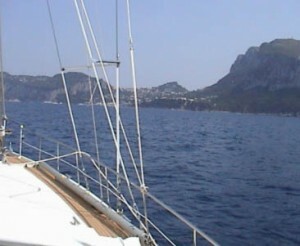 We went together out of the harbor to test the engine and everything seems to be ok so after refueling we left for Capri. 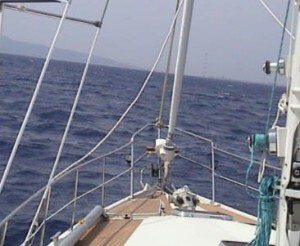 Capri is around 20 nm away and we had a wonderful sail with calm sea and we reached good speed although the wind was around 10 knots. 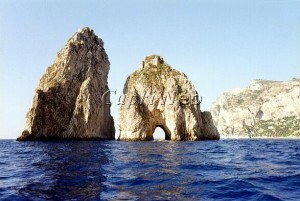 We arrived in the Capri Marina the entrance which was invisible. We succeeded to moor the boot in a very tight place. The girls went to the town and I joined them after one hour. The town was extremely nice with a lot of green, gardens nice hotels, bars and restaurants. It seems that Capri is worth the name. Captains Commentary We left early in the morning with low wind and after 7 hour we arrived at Camerota.. We were a little anxious as the marina was under construction and we didnt know exactly what we had to expect. But it was friendly and well organized after mooring we went in the town for dinner and in the restaurant they were friendly when we told them that we are Greeks. It seems that there is still a greek background in the region. Captains CommentaryWe left early in the morning after buying fresh bread and paid the marina. At the exit we touched a sand bank but it was harmless. We made a around and left for Cetraro. We arrived around 3 pm and we left immediately with the dinghy for swimming. We played in the beach and suddenly a jelly fish hit Hara in the arm and the face. We were afraid as she started to cry and became very red so Gianna went with her to the hospital and she was back laughing again and waved good bye to the hospital personnel that were so friendly to her. After this adventure we went to the small town to have a look and buy some provisions and found out that the people were very friendly. We had a nice dinner and went to sleep as we had to leave early in the morning for Tropea. Captains Commentary We left at 6.15 in the morning and it was the first day with some wind to do some sailing and we went pretty fast. We arrived around 3 again and went for swimming in the very nice beach close to the marina. The water was blue and the city a real surprise we liked it very much. 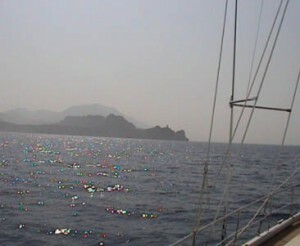 What a nice sailing in the Tyrrhenian Sea. We arrived in Tropea around 2.00 and we went for swimming in the near by beach. The water is warm and very clear. 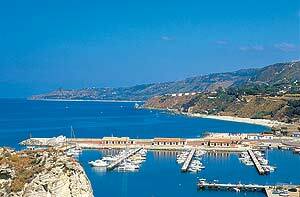 The girls had a wonderful time after that we returned to the boat and went to discover the city of Tropea. The hidden jewel. Such a nice city full of people old castles and houses very friendly people and perhaps we have to return here in a few years. 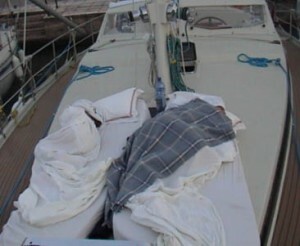 Captains Commentary We left as usual very early in the morning and arrived to the notorious Messina straits. The wind increased and just the thinking to be there like Odysseus on a old boat was terrifying. Gianna is wondering the famous Scyla cap near Messina. After a very difficult maneuver in the Messina marina we moored the boat and went to discover the city which is very lively in the sea with all the ferries between Italy and Sicily coming and going but not very nice overall especially after all the nice places we have visited. And our arrival in Kefalonia after 30 days away was a surprise. In front of us a music band was making trials for the night performance of Greek music in honor of the nautical spirit of the Greeks. What a difference with the rest of Europe. We went with Hara to buy feta and they all went to visit the city of Argostoli. Our trip is approaching its end and we will miss it I am sure but we have the best of memories for the years to come. The following video is the welcome back to Greece. 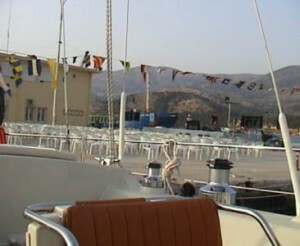 The greek song speaks about a boat that arrived in Argostoli what a coincidence! We arrived in Galaxidi early in the afternoon. 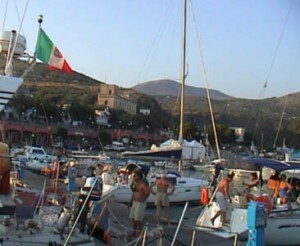 Galaxidi is a place I like very much as we had nice memories of our sailing in the past . The night in Galaxidi was very hot and the girls decided to sleep outside. So they brought out their beds and slept al fresco. Captains Commentary We started early as usual as we had to pass through the Corinth Canal which takes time and money and everybody was starting to be a little anxious to arrive. 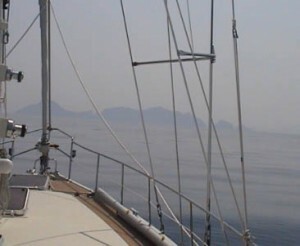 videos/Corinth.WMV We approached the Corinth Canal after passing the cape near Lutraki. It looks like cape Horn. And finally we saw Kalamaki ! We were happy but also sad that such a nice trip has to come to his end. But this is something that applies to all nice things in life. Our trip is coming to his end. We arrived safely after 1205.8 nautical miles with our new boat. I would like to thank my family for their dedication to the trip and George as without him the trip could not have been so successful. I would like also to thank Dimitris Siatiras who helped me during the trip with the website. I hope you enjoyed it as much as we have. 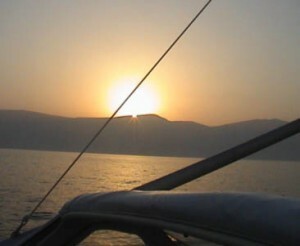 The following video is a good sign of the good time we had onboard. The trip lasted long but it was long enough?But do not hurry the journey at all. Rich with all you have gained on the way.